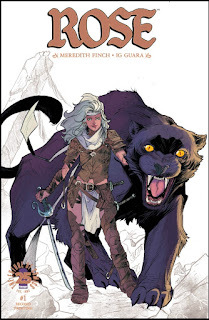 NEGROMANCER 2.0: Image Comics Grows a Second Printing of "Rose #1"
PORTLAND, OR — The bestselling fantasy series ROSE by Meredith Finch (Wonder Woman, Little Mermaid) and Ig Guara (Batman: Arkham Knight, Blue Beetle, The Ravagers) is being rushed back to print in order to keep up with overwhelming customer demand. A classic fantasy tale about a girl trying to restore balance to a broken world. Rose must connect with her Khat—Thorne—to become the Guardian the world needs. But things aren’t easy for Rose and Thorne. The powerful sorcerous Drucilla has many demonic allies—all of them focused on stopping one scared little girl who’s desperately trying to stay alive and do what’s right. ROSE #1 will remain available for purchase across all digital platforms, including the Image Comics website (imagecomics.com), the official Image Comics iOS app, Comixology’s website (comixology.com), iOS, Android, and Google Play. ROSE #1, 2nd printing (Diamond Code MAR178085), ROSE #2 Cover A Guara (Diamond Code MAR170774), Cover B Mendonca (Diamond Code MAR170775), Cover C SPAWN (Diamond Code FEB178670), and Cover D SPAWN B&W (Diamond Code MAR178016) will be available on Wednesday, May 17th, 2017. The final order cutoff deadline for comics retailers is Monday, April 24th, 2017.